Home Boxing Weigh In Results: Menayothin 105 lbs, Jerusalem 105 lbs. Weigh In Results: Menayothin 105 lbs, Jerusalem 105 lbs. Battle of Undefeated. 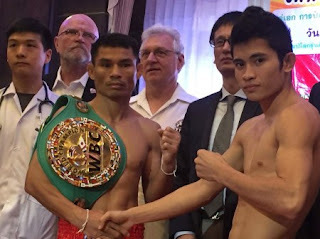 Veteran and undefeated world champion Chayaphon Moonsri weigh-in at 115 lbs while the challenger from the Philippines Melvin Jerusalem was also scaled in at 115 lbs. The fight for the WBC world minimum weight title will be held tomorrow January 25, 2017' in Phitsanulok, Thailand. Menayothin will defend his title for the 5th time. He won his title in 2014 against Oswaldo Novoa via stoppage. The Thailander defended it 5 times including over the two Filipino challengers Jerry Tomogdan and Jeffrey Galero. Meanwhile, Melvin Jerusalem will be fighting for his first ever world title fight. The kid has only 11 professional fights but already ranked no. 11 in the world in the minimumweight division by boxrec.